Technically yesterday was the final day in the 30 day blog journal, but I had fallen a little behind....so I'm catching up today! I had no idea how hard it would be to post every day! I have to say though, that I have really enjoyed having a little writing prompt every day and especially getting to read everyone else's entries. I wrote about a lot of these in my 101 post....you can see that here. Honestly, I'm living my dream right now. As cheesy as that may sound, being home with my sweet baby and having a a husband that loves me unconditionally is truly the fulfillment of my heart's desire. Lord willing, we will have more children and raise them to know Him. I pray that in the "future" I will continue to love the Lord and love others. 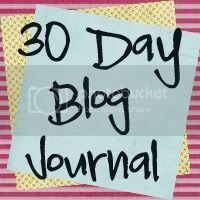 This completes my 30 day blog journal! I hope that you've enjoyed reading it as much as I've enjoyed writing it. Hopefully you've learned a little bit more about me in the process, too! If there's anything else you want to know, feel free to ask! "Now listen, you who say, "Today or tomorrow we will go to this or that city, spend a year there, carry on business and make money." Why, you do not even know what will happen tomorrow. What is your life? You are a mist that appears for a little while and then vanishes. Instead, you ought to say, "If it is the Lord's will, we will live and do this or that."